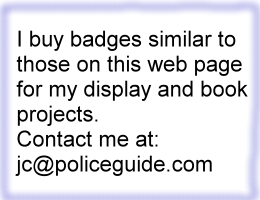 Rare 1st issue Jersey City, New Jersey Police badge, (folded point star) with chain keeper, one of 30 authorized on Novemeber 23, 1852. 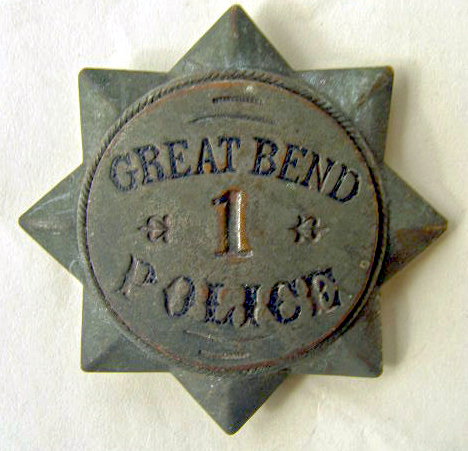 1st issue Great Bend Police badge #1. 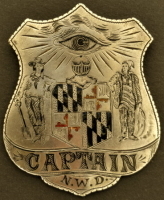 2nd issue, circa 1880's, Atlantic City, New Jersey Police badge, made by Walton & Co. 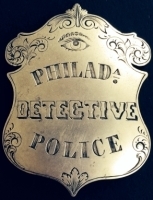 Phila., PA.
1st issue, circa 1870, Atlantic City, New Jersey Police badge, one of two known to exist. Chief of Police Perth Amboy N. J. 14k gold. This East Paterson New Jersey police badge is credited with saving the life of the officer who wore it. The suspects bullet hit the badge and as you can see in the photos the badge took quite a beating. In Nov. 1972 the citizens of East Paterson changed the name of the city to Borough of Elmwood Park.